Blue Lace Agate has a soft, soothing elegance; like sky-blue waters released from winter's grasp. Its graceful, circular design has a stimulating, positive effect on emotions and attitude. It is not a stone of protection, but rather of encouragement and support. Its circular flowing energy calms, uplifts and elevates. Blue Lace Agate is a stone of communication, helping those who have difficulty being heard by others, or who need confidence and articulation to share their truths. It provides clarity of thought and unwavering intent in regards to what matters most. 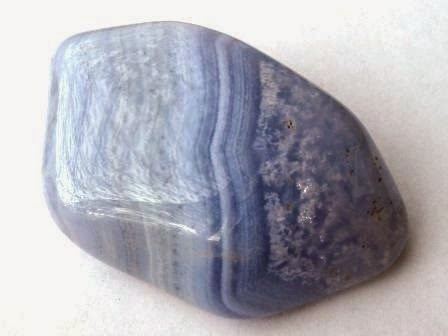 Blue Lace Agate is a Stone of the Diplomat, assisting communication in situations were angry words must be avoided, but clear understanding is necessary. Blue Lace Agate is a variety of banded Chalcedony, a mineral of the Quartz family. It is usually banded in layers of predominantly light blue, striped with brighter blues, whites, and even brown threads of color. Agate is sometimes called the earth rainbow because, in its various forms, the concentric bands in nature form nearly every color the earth can produce, including a colorless form. Historically, Agate has been discovered with the artifacts of Neolithic people, and was used as healing amulets and ornamentation dating back to Babylon. Its medicinal uses continued through the ancient Greek and Egyptian civilizations, and spread throughout Africa and the Middle East into Russia. Agate sparked a world renowned stonecutting and polishing industry in Germany that flourished from the 15th to the 19th century, and exists today. Metaphysically, Agate has a lower intensity and vibrates to a slower frequency than other stones, but is highly regarded as a stabilizing and strengthening influence. The layered bands of microscopic quartz in Agate may appear delicate, they are actually very strong. Agate is excellent for balancing emotional, physical and intellectual energy, and in harmonizing yin and yang, the positive and negative forces of the universe. Blue Lace Agate inspires loyalty and trustworthiness. It is a support crystal for all caregivers, calming stress-related situations and overcoming communication difficulties. Carry or wear Blue Lace Agate if you struggle to express your emotions without getting upset. Blue Lace Agate counteracts the repression and suppression of feelings caused by past fears, judgments, or rejections. It dissolves old blockage patterns and doubt, and permits new methods of self-expression and growth. 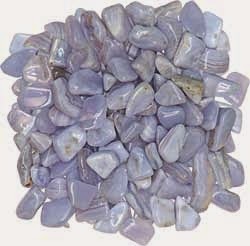 Blue Lace Agate is especially beneficial in helping men realize and accept their feelings and sensitivities. As a support crystal, Blue Lace Agate assists those who fear speaking in public or sharing thoughts and ideas with strangers. It is a great stone for those who communicate for a living, such as workshop directors, lecturers, teachers, or anyone who must connect in a clear, intelligent manner. 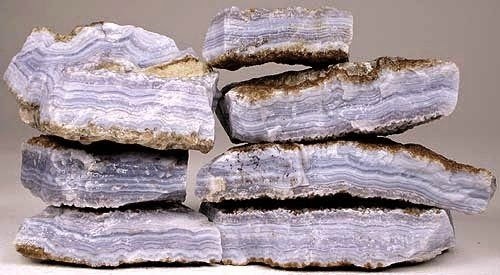 Blue Lace Agate also tranquilizes and relaxes the mind of executives, and calms stress in postal workers. Blue Lace Agate's calm, centering properties also aid those who are unable to stop talking, or who speak before thinking about the consequences of their words. It encourages discernment about the thoughts they share and the beauty of inner silence. It helps those who have trouble keeping a secret, and promotes understanding in the sanctity of trust. It is an excellent stone for imaginative children who present created stories, and may need help in discerning whether an event was real or imagined. Agate promotes inner stability, composure, and maturity. Its warm, protective properties encourage security and self-confidence. It is a great crystal to use during pregnancy. Agate also helps new mothers avoid the "baby blues" sometimes experienced after giving birth, and an Agate jewel worn between the breasts encourages lactation. Blue Lace Agate is thought to relieve sore throats, aching or swollen glands in the neck, and may aid thyroid problems. It helps strengthen the skeletal structure, and is useful in treating arthritis and hereditary bone deformity, as well as the mending of breaks and fractures. Agate is helpful to the heart and blood vessels. Wearing an Agate in the middle of the chest strengthens the cardiac muscle, and heals emotional disharmony that prevents acceptance of love. Blue Lace Agate is soothing for tension-related headaches and high blood pressure. A cold Agate placed on the forehead is generally effective in curing fever. (If the fever returns, however, consult a doctor.) 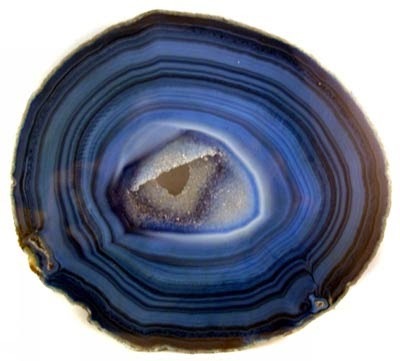 Agate may also reduce the symptoms of epilepsy, and for some people guards against sleepwalking. Agate encourages a sense of reality and pragmatic thinking. Agates with regular designs soothe those who desire peace and harmony, while those with irregular designs can stimulate action and important decision making. Agate is beneficial in self-analysis and uncovering hidden circumstances that might interfere with well-being. It promotes self-acceptance and confidence, encouraging the speaking of one's own truth. Agate overcomes negativity and bitterness of the heart, by healing anger, fostering love, and lending the courage to start over. It is useful for any kind of trauma. Agate stabilizes the aura, eliminating and transforming negative energies. Its cleansing effect is powerful at all levels. Agate stabilizes the aura, eliminating and transforming negative energies. Its cleansing effect is powerful at all levels. Blue Lace Agate, with its blue crystal energy, will open and clear the Throat Chakra. The Throat Chakra is the voice of the body, a pressure valve that allows the energy from the other chakras to be expressed. If it is blocked or out of balance, it can affect the health of the other chakras. In balance, it allows for the expression of what we think and what we feel. We can communicate our ideas, beliefs, and emotions. When the throat chakra is in balance and open, we can bring our personal truth out into the world. We have an easy flow of energy within the body and spirit. The energy that springs upward from the lower chakras can continue its path enabling free expression and natural release. Blue Lace Agate can also be used on the Third Eye to soothe an overactive mind and to still one's thoughts. The Third Eye, or Brow Chakra, is the center of perception and command. It directs our sight and everyday awareness of the world. Our consciousness is located here. Blue Lace Agate contains the qualities of flight, air, movement and grace, and helps one attain an extremely high spiritual level, especially when used for inner attunement. Agate raises awareness and links into the collective consciousness of the oneness of life. It encourages quiet contemplation of one's life experiences that lead to spiritual growth and inner stability. Blue Lace Agate is pale blue, usually banded with brighter blue, white or even brown threads of color. Blue Lace Agate is the color of ice reflecting the slowly lightening winter sky as the deep violets depart and the sun climbs higher each day. As winter gives way to spring, and new life is ready to burst forth, blue marks the beginning of life and emotion. Blue crystals bring faith, patience, and respect, lending the focus we need to become more sincere, act more responsibly, and become more trustworthy. The lighter bands of Agate help us reflect on, question, and relax in our acceptance of the life we have. They help us develop patience, reconcile differences, or seek forgiveness. They're excellent for recovery efforts from addictions or destructive patterns, aid in curbing tempers, and help us become more dependable and cheerful. The darker layers of Blue Lace Agate enhance respect and compassion within ourselves. They teach us humanity, discretion, and honor. Blue Lace Agate provides a wide variety of formations conducive for meditative focus. The intricate movements within the crystal encourage a calm, relaxing state and open the mind to higher thought and inner truths.